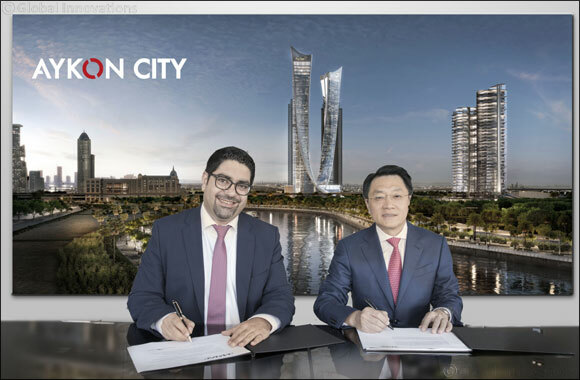 Dubai, UAE – 1 September 2018: DAMAC Properties has awarded an AED512 million construction contract to China State Construction Engineering Corporation (CSCEC) to build tower C of AYKON City, DAMAC’s luxury mixed-use development on Sheikh Zayed Road. The new contract covers civil construction works for tower C, the residential tower in the award-winning USD2 billion development, overlooking the Dubai Water Canal. Tower C, known as ‘The Residence’, will have a total built up area of nearly 1.8 million square feet. It will feature studio, one, two and three-bedroom apartments, all with premium interiors and exceptional finishing. The tower will also boast ‘The Club’, an exclusive residents-only lifestyle and entertainment space with spectacular views of the iconic Dubai Water Canal and Safa Park. The 62-floor tower is made up of two basement, a ground and ten podium levels, in addition to a dedicated lifestyle and entertainment level, 48 residential floors and a rooftop. AYKON City is one of DAMAC’s most ambitious development projects in Dubai. It features the unique concept of an entire city-like infrastructure within Dubai. The mix-use development includes premium residential, hospitality and commercial units. AYKON City will also have seamless access to the 3.2km long waterway of the Dubai Water Canal, which runs all the way to the Arabian Gulf, from the Creek in Old Dubai.